Hotel Hershey is the more upscale Hershey property. The locale: About 5 1/2 hours away in southeastern Pennsylvania. The scoop: Hershey, Pa. is the epicenter of Hershey’s Chocolate, founded by Milton S. Hershey. What better way to celebrate the holidays than in a place that’s for kids (and kids at heart), and includes a holiday Kiss or two? It’s a trip for both families and adults. The Circular Dining Room at The Hotel Hershey, 100 Hotel Road. The historic Hotel Hershey was built by Milton Hershey to overlook his chocolate factory. The swanky dining room, designed without corners, overlooks the back of the hotel gardens. Find chocolate-inspired menu items like Cocoa Dusted Diver Scallops. Houlihan’s Restaurant & Bar at the Hershey Press Building, 27 W. Chocolate Ave., is a more casual option, while Devon Seafood & Steak (also at the Press building) serves a more upscale palate. Hershey’s Chocolate World, 101 Chocolate World Way. Have breakfast with Santa, Dec. 1-2, 8-9, 15-16, 22-23. The annual Hershey’s Holiday Chocolate House is decorated entirely with chocolate and confections, on display until Jan. 1. The Holly Jolly Trolley gets guests in the spirit with caroling, stories, and perhaps a big elf in a red suit, Dec. 22-31. Hershey Gardens, on the grounds of the Hershey Hotel, will have a Christmas tree showcase in the conservatory, including a 14-foot poinsettia tree, through Jan. 1. The Hershey Story Museum, 63 W. Chocolate Ave., is a must-see anytime, but for the holidays, the Little Elves Workshop (through Jan. 1) and a Sensory Friendly Elves Workshop (Dec. 22 & 29) will be open. Snowball Saturdays feature indoor snowball fights, Dec. 1, 8 and 15. Holiday themed chocolate lab classes will be available daily through Jan. 1. And on Jan. 1, there will be a New Year’s Bubble Wrap Stomp. Hersheypark Christmas Candylane, 100 W. Hersheypark Drive, features more than 50 rides (weather permitting), including 40 rides for children and six roller coasters. Four million sparkling lights illuminate the park in addition to the dazzling Noel light show choreographed with holiday music. Drink signature hot chocolate and see the holiday show “Up on the Rooftop” in the heated Music Box Theater. Open select dates through Jan. 1. MeltSpa, 11 E. Chocolate Avenue, is planning Cinnamon Mocha treatments for December and January. 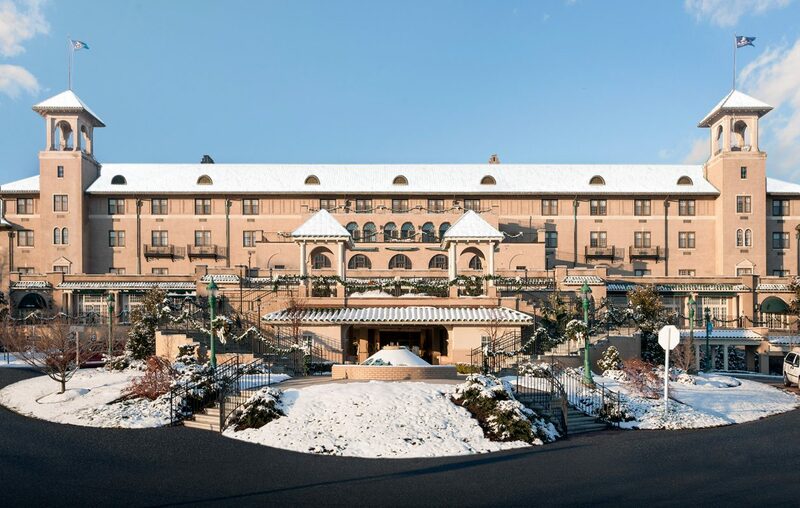 The Spa at The Hotel Hershey will offer Peppermint Hot Chocolate immersions as well as Peppermint Mocha manicures and pedicures. Chocolate World, hands down, is the best place to shop. You can stock up on every type of candy the company makes, including some new items not yet on the market. There’s also clothing (think Reese’s T-shirts), collectibles and more.